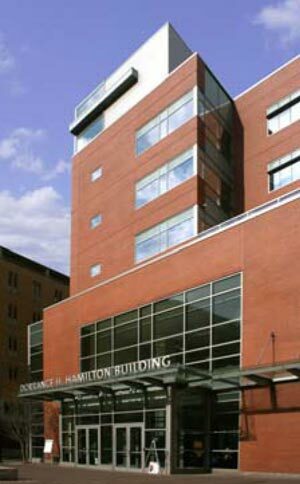 Located at the heart of Thomas Jefferson University’s academic precinct, the Dorrance H. Hamilton Building represents a new paradigm in healthcare education. The six story, 136,000 square feet, state of the art academic building houses a technologically advanced auditorium, small and large group classrooms, and a two floor clinical skills center featuring a virtual diagnostics and surgical suites. This educational facility was designed to promote a team-based model for doctors, nurses, healthcare professionals, and scientists who will define the future of patient-focused care. The key to a successful project of any size, let alone the size and complexity of the Dorrance H. Hamilton building, is planning, communications and a team of professionals dedicated towards a goal of success and client satisfaction. RJC Designs Technology Consultants, AVSG (HiFi House) equipment suppliers and integrators were the principle A/V and media related team of professionals that had that common goal. Brought in during the very early stages of development and as part of the architect’s team RJC Designs, as the project technology consultant, provided product and operational guidance, system designs and budgetary information. This information was developed in conjunction with input from the various user committees. RJC also worked with the architect in providing mechanical, electrical and infrastructure requirements applicable for the technology designed. During the design development stage AVSG was brought onto the team as the contractor of choice. Having confidence in AVSG’s abilities from previous campus experience the University wanted to be sure that both the consultant and the integrator were working together towards the same understanding of direction. RJC’s designs combined with the practical and professional know how of AVSG proved to be a winning combination. 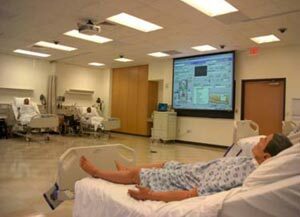 The technologically advanced Connelly Auditorium, located on the main floor, was designed to hold an entire medical college class (296) and will be used for continuing medical education as well. 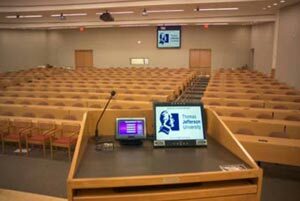 With full audio/visual capabilities, including Internet access, the auditorium has teleconferencing capabilities, which enable a lecture held here to be broadcast to and receive input from an off-site audience. For example, pediatricians at DuPont could ask questions of a lecturer they’ve been watching in the Connelly Auditorium. Additionally, the lobby is connected to the auditorium so that speakers can be broadcast into the lobby if there is an overflow audience. One of the unique features of the auditorium was its multi image and screen configuration. The main viewing screen for media presentations and video viewing is a large electrically operated 16:9 roll down screen. Additionally, two side-by-side 4:3 screens were installed which would allow teleconference far and near viewing simultaneously or side by side comparison of computer with document camera or, any combination of sources. Lowering either screen would also permit the use of projected images next to an exposed white board area. At the rear of the auditorium is a projector and screen. This combination will provide a “Heads Up” display, allowing the presenter a view of any combination of sources including far end video conferencing without turning towards the main screen. 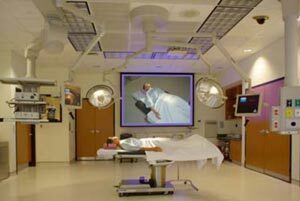 When not in use, the screen will be retracted into the ceiling. The versatility of the auditorium and its operation was managed by an AMX control system. This user friendly interactive control panel provided easy and intuitive access to all the sources and functions of the room. Auditorium with multimedia presentation and video conferencing capabilities. Lobby with projector and screen for overflow and stand alone presentations. Children Treatment and Adult Rehab Classroom – 3 cameras recording one camera at any given time at high resolution. O.T. Splint Lab Seminar Room – 3 cameras recording one camera at any given time at high resolution. O.T. Apartment Seminar – 3 cameras recording one camera at any given time at high resolution.